Froc is an adjustable high chair for toddlers and children from the ages of 6 months to 10 years. Designed for stability and maximum safety. The chair is mounted on a four-pronged base which ensures that it remains balanced no matter what the sitter may be up to. 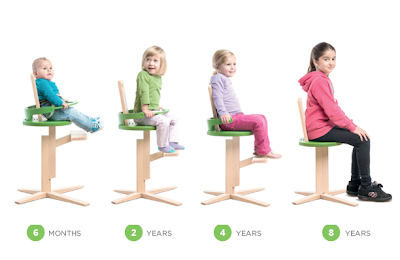 It is easily assembled and adjustable, growing with the child. The seat, footrest height and the backrest position can all be repositioned and the safety belt removed.